Different types of ink and ink pads are used in card making – so which one do you use and why? It all depends what you are going to use it for! Ink pads come in a wide range of colours and sizes. Dye based pads use a water based ink that’s available in a huge variety of bright colours. It is quick drying as it absorbs itself into the paper. The ink has a slightly transparent quality and may fade with time. 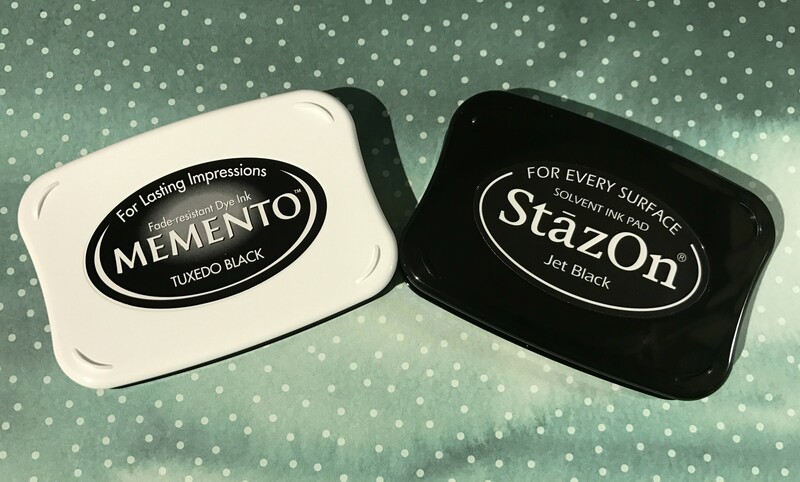 The Memento Tuxedo Black is a favourite for stamping outlines as it doesn’t smear when used with alcohol colouring markers (eg: Copic markers). 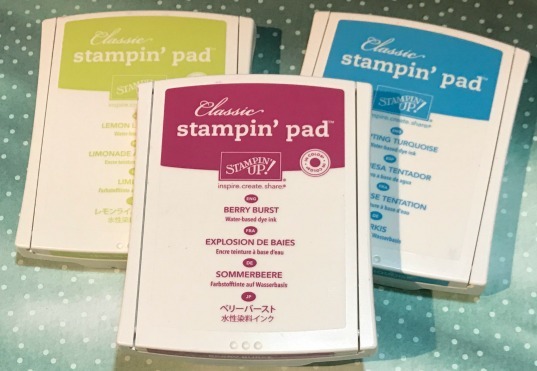 Other dye based pads such as those produced by Stampin Up can be coloured after stamping with water based markers or watercolour pencils. Pigment inks are thicker than dye based inks and are slower to dry on paper. They found in richer vibrant colours including metallic silver and gold. They can also be used on other materials such as ribbon and are less likely to fade. As pigment inks dry slowly they can be used for heat embossing and produce a more even colour when blending with a dauber. The downside is the slow drying can lead to smudging, especially if you watercolour before it’s completely dry. It will not dry on glossy paper unless it's embossed first. Embossing ink – An oil based clear sticky ink that can be used with coloured embossing powders. The clear Versamark is a popular choice. Ombre inks pads – These are ink pads in several colours. They are in a single colour family with dark ink at one end fading to light. Staz On – An alcohol based ink that’s quick drying and permanent. It is used for glossy paper and other non porous surfaces. .....with ink refills! These are small bottles of ink produced in the same colour of your ink pad that you can add to your ink pads if they become dry. Ink refills are also useful for creating some different card making techniques such as the baby wipe technique. Dye based and pigment inks can be removed with a damp paper towel or a baby wipes (alcohol free). Stamps benefit from being cleaned with a stamp cleaner as this will also condition the stamps. Cleaners can be used with a soft toothbrush or a stamping scrub. Black ink is more difficult to clean and it can stain stamps especially the permanent varieties such an Archival ink or Staz On. Staz On produce their own solvent cleaner for it’s ink.